It’s no secret that I prefer AirServer above AppleTVs for classrooms. The ability to mirror a faculty iPad to a large projector screen turns it into a powerful educational tool, and I believe AirServer is the better choice for most schools. I manage AirServer installs in 30 classrooms, and even have it installed on my HTPC at home. My extensive use of this software means that I need to be able to install and activate the software in a reproducible way for our classroom computers as we periodically update our classroom image. 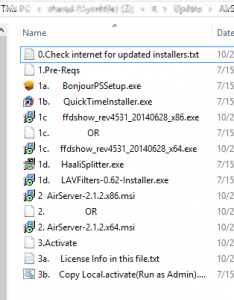 What you may not know is that installing AirServer on Windows is not as straightforward as we’d like. This isn’t entirely AirServer’s fault. The AirPlay protocol (and processing power limitations of your iOS device) mandate that the video streams sent from your device keep the original encoding from whatever the current random app is showing. AirServer depends on the operating system’s ability to decode these video streams. The variety of video types used in various iOS apps far exceeds what codecs are included out of the box with Windows. I expect that AirServer could, of course, package the most-used of these codecs with their software (and I expect they do this to some extent already), but there are way too many to get them all in one place, and doing so would add licensing costs to the product that I’m happy to avoid. In order to reliably mirror your device there are still some common and uncommon codecs that you’ll want to be able to handle at the operating system level, as well as an additional networking standard you’ll need to support. In short, there are prerequisites you’ll need to get the most out of AirServer that are not included in the software’s installer. I think AirServer could do more with their Windows installer to make these easy to acquire, but until then I’ve got your back. 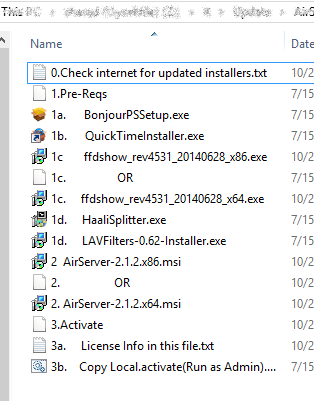 Note how I’ve renamed files so that there is an intuitive flow for the installation process. We’ll go through the steps indicated one by one. AirServer itself has an automatic update mechanism, but most of the other items do not. I want to make sure I’m not pushing obsolete (and possibly insecure) software to my classrooms, and so the first step (Step 0) is to make sure that each of the items I’m using is the most recent (read: fully-patched) version available. I’m considering replacing several of the actual download packages with shortcut files to the download page for the project, to ensure I always get the latest version. This brings us (at last) to the prereq’s themselves. The full list is available here. The first is Bonjour Print Services for Windows. The documentation says that iTunes is enough, but I’ve had better results when I ensure the Print Services package is installed. Print Services is a free download from Apple, and it allows your Windows computer to support the multi-cast DNS protocol (mDNS). I have strong feelings about this protocol that are not fit for public print, but for better or worse you need this for anything Apple, including AirPlay mirroring. This is the most important prerequisite. Without it, AirPlay just won’t work. The remainder are various open codec packages for use with Windows DirectShow. The packages combined allow you to play almost anything. Be sure to pick the correct x86 or x64 installer, depending on your operating system type. I also need to mention here that there is a current bug in the iOS YouTube app (YouTube videos still play through iOS Safari) and that some apps use copyright protection for their content and just will not mirror, even on a real AppleTV. Now at last we come to installing AirServer itself. As you run through the installer, I need to call out a few of the options. The first is that you should NOT activate AirServer during the install process. This is especially important for my classrooms, where I need to support many users, but even on your home computer, if you have more than one user account that may want to use AirServer, do not activate at this time. The other option is whether you want to have AirServer run in the background automatically. For my classrooms, where many users log in and out throughout the day, I’ve found this option can cause problems. If you are the only (or primary) user on the machine, where it’s less common to be logging others in and out of the computer, it’s probably safe to let it run in the background. Replace “<<License Key>>” with your license key, and “<<Mirror Name>>” with the name you want to show on your iPad or iPhone when you open up the AirPlay control panel to start mirroring. If you don’t activate and set the name in the console, it will only activate for the current user. When other users try to run the software, they’ll have to reactivate it and set their own name. The key will be saved, and they’ll be successful… at first. But it’s a step they shouldn’t have to take, and soon you’ll run out of activations for your license. The console method activates it once for every user on that PC.